When I was a younger I was a total dork. Yes, those who know me would say that's still true, but I spent most of my time in junior high school praying that I would start to fit in, start to feel cool. Its a strange thing to know that you're ready for college when you're 13, not at an intelligence level, or even at an emotional level, but just that you won't be able to feel well adjusted until you got there. So I took the SATs in 7th grade. Did well enough to end up here. And finally found a place where I fit in, with friends for life. So I got the long-awaited postcard in the mail yesterday. And no, I will not be added to the contestant pool of Meredith Vieira's version of Who Wants to Be a Millionaire. It's funny, as much as people kept telling me that it was going to happen and whatever, I kept playing it down, "its still a long shot... even if I get the yes postcard, that doesn't mean I'm on the show..." "They're interviewing tons of people..."
But now that the answer has arrived, I find myself disappointed. It is mostly because it follows my current run of luck, which I had hoped was changing, but apparently not quite yet. So if anyone knows when they're casting for the next round of World Series of Pop Culture, let me know, because I RULE at that show! So I'm planning a bachelor party for this coming Saturday night, and I've been having trouble with it for a variety of reasons. 1) I'm not the best man, so I feel a bit a weird about taking the lead, but the best man is in Austin, and I'm here, so its on me. 2) The groom isn't what you'd call a total boozehound or player. He drinks to be social, but his fiance is his first real girlfriend of consequence. 4) I've just never planned one before. So based on all this, I'm going to try and keep it semi-tame, while still working to embarrass the groom when at all possible. As such, I went shopping last night the Pleasure Place in Georgetown. And quite honestly, I was very disappointed with the selection. 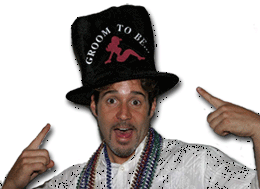 There just aren't enough shirts/hats/badges/etc to embarass bachelors on their big night. Plenty of items for bachelorettes, but a bizarre double standard. Maybe there's money to be made there? "Mom, Dad, don't worry... I have a new job. I sell bachelor party supplies..."
so if you see a short Italian guy out in DC on Saturday wearing it, please stop by, say hi, and buy him a shot! Oh, and I've been added to the DC Blogs list... go me! Well, after 2.5 weeks, the landlord is finally realizing that the flood damage was significant. Yes, it still reeks. Yes, we think there's mold growing. So they're going to rip out the carpet, and replace it, which means I should be able to get my bedroom back sometime in the next week. Do you ever stop to think how much of our life runs on auto-pilot? I do things all the time, and then five minutes later, freak out about whether I missed a step, or even did it at all. Whether its basic stuff like locking your car door, or turning off the oven, or like just happened at work, I managed to convince myself I sent an email to the client without putting a greeting at the top (which I did), it happens to me several times a day. I drive to crew practice at 5:15 am several times a week. I know I'm not really awake as I do it, yet I always make it there in one piece and without accident. There are days I barely even remember passing certain landmarks on the road. Are we missing moments in our life, or are we just so into a routine, that it doesn't require any thought and we're just essentially fast-forwarding to the next moment? What do you all do on auto-pilot? Don't American Idol contestants want to be taken seriously? So that Ford commercial with Taylor Hicks... Now, I haven't watched the show since season 2, but I'm still fairly up to date on my pop culture. Did he really go to the trouble of embarassing himself on national television for weeks and weeks, just so he could sing 2 lines of a crappy Ford jingle? Come on now man, Kelly Clarkson has way more respect for herself than that!